PORTLAOISE will play Kilmacud Crokes in the Leinter club SFC semi-final in Parnell Park on Sunday November 24th after ousting defending provincial champions, Moorefield, in Newbridge today. In doing so, the seven-time Leinster winners extracted some revenge for last year’s quarter-final defeat to the same opposition after they led by four points with just minutes to play in O’Moore Park. Portlaoise led by seven points here at the break after a half played in miserable weather conditions, a gap as attributable to Moorefield’s own shortcomings as the positive aspects of the perennial Laois representatives’ performance. Malachy McNulty’s team pressed high, dominated midfield and tackled in aggressive, hustling packs. But Thomas Corley, the Moorefield goalkeeper this year in the absence of Tom Kinsella, had a nightmare half. He failed to collect four routine balls, one of which led to Craig Rogers’ tap-in goal while another preceded one of Paul Cahillane’s three first-half frees. Corley’s kick-outs were devoured by Portlaoise – and Ciarán McEvoy in particular – while two restarts were sent limply over the sidelines. There were feisty exchanges as the teams retreated for half-time but Portlaoise looked firmly in control. Moorefield even replaced Corley at half-time, bringing on sub ‘keeper Ian McDonnell in his place, with the new man making one outstanding reflex save from Portlaoise sub Scott Lawless. Goalkeeping mistakes weren’t the sole preserve of Moorefield, however. Three minutes into the second-half, Graham Brody - Portlaoise’s All Star-nominee – inexplicably failed to deal with a short-falling shot from Eddie Heavey and Niall Hurley-Lynch was on hand to bat a much-needed goal for the defending Leinster champions. 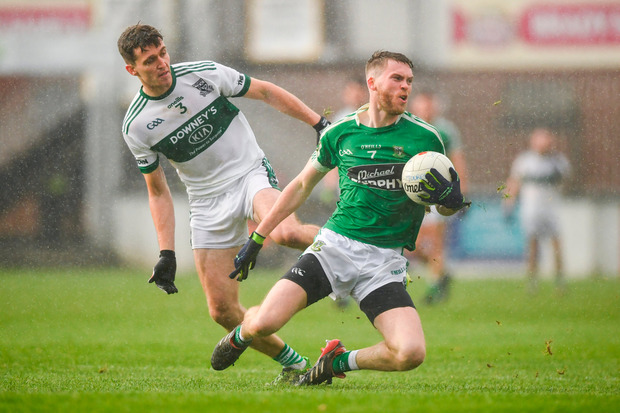 That score brought Moorefield’s deficit back to three but they couldn’t quite reach Portlaoise, mostly because of the potency of Cahillane – who scored three points from play in the half – and the ageless ‘Bruno’ McCormack. SCORERS – Portlaoise: P Cahillane 0-7 (3f), C Rogers 1-2 (0-2f), B McCormack 0-2, K Lillis, G Dillon, R Maher 0-1 each. Moorefield: N Hurley-Lynch 1-1, É O’Connor 0-4 (1f), R Sweeney, A Tyrrell (2f), E Heavey 0-2 each. Pat Spillane - Hurling has a big marketing problem that must be addressed. How many players can fans recognise?